Friday, March 20th – Sunday March 22nd, 2015. With Prema Dasara and sponsored by Austin Tara Circle. Experience the mind’s radiance as the Goddess Tara! Dance your path to awakening, reconnect with your highest potential and join us for a healing power journey into the realm of the Divine Feminine. Prema Dasara will teach an intensive and inspiring weekend on the Mandala Dance of the 21 Praises of Tara. Open to everyone; no dance experience required. A precious opportunity to receive instruction from a teacher of rare talent and sublime insight, holder of a unique Tara lineage, Prema Dasara is the creator of a ritual dance of empowerment and sacred celebration. It has been praised by high lamas of many schools of Tibetan Buddhism and enjoyed by dancers from all spiritual traditions. Lama Lobtsul, resident Lama at Palri Pema Od Ling, will be offering a Green Tara empowerment as part of the weekend celebrations. Lama Lobtsul was trained in all aspects of Tibetan Buddhism at a traditional monastery in Tibet. He was also the leader of the annual Tara ceremony for many thousands of practitioners. We will begin to delve into our understanding of Tara and her divine qualities Friday night during Prema’s evening teaching. Saturday begins our journey into the Heart of Tara’s Mandala! 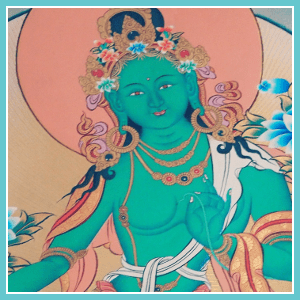 Together we will learn Prema’s beautiful dancing meditation of the Mandala Dance of the 21 Praises of Tara, culminating in receiving the sacred Green Tara Empowerment. Get the whole weekend package, Friday through Sunday, for $138.